Autodesk Vault is integrated with other Autodesk Products, including Inventor Professional, AutoCAD Electrical and Mechanical and other Civil 3D products, which makes it the ideal CAD data management tool to help design teams effectively track ‘work in progress’ and maintain multi user environments. The software serves different industries, including manufacturing, architecture, engineering and construction and is also available for non-CAD users as Vault Office (separate license to work with Vault Professional or Vault Workgroup). Autodesk Vault product family includes Vault (WIP data management), Vault Workgroup (revision management and security, personalization) and Vault Professional (integration with ERPs, item master etc.) The Professional version also includes support for Multi-Site replication and can co-exist with enterprise business systems. The software supports most of other Autodesk products as well as Microsoft Office and Outlook (Vault Workgroup and above). Autodesk Vault allows design teams to build a more efficient product development cycle by creating better deigns and minimizing errors. The software allows efficiently tracking design revisions and smoothly managing the release process. Autodesk also provides a cloud-based service with subscription or perpetual license with the maintenance plan. Vault Professional supports unique user logins, which ensures transparency and accurate history tracking. The three levels of security i.e. user login security, file/folder security and lifecycle security provide an effective shield against security threats. The software also excels in the searching department and supports file content indexing, allowing teams to search text inside documents, including MS Office files and DGWs. All links to parts and assemblies get updated as they are renamed or moved, which is a big plus for Inventor users who are dealing with thousands of parts. The software makes it easier to manage Change Orders and supports setting multiple routings. Users automatically get notified when they are required to participate in a change order. The CAD files related to a change order are also added automatically, while the users can leave their comments to facilitate the change. The Vault also records all changes made and provides complete history when teams need to review them. Bill of Materials are easily accessible from the vault through the Item Manager, while entries not including CAD files can also be added to the BOM, such as labor and maintenance items, grease, fuel, paint and so on. If you are considering Autodesk Vault it might also be beneficial to investigate other subcategories of Best Product Lifecycle Management Software - PLM collected in our database of B2B software reviews. It is crucial to keep in mind that virtually no software in the Product Lifecycle Management Software - PLM category will be a perfect solution that can fulfill all the needs of all company types, sizes and industries. It may be a good idea to read a few Autodesk Vault reviews first as certain solutions may excel only in a very narrow group of applications or be prepared with a really specific industry in mind. Others can function with a goal of being easy and intuitive and as a result lack complicated functions welcomed by more experienced users. You can also come across software that focus on a wide group of customers and provide a complex feature base, but that frequently comes at a more expensive cost of such a software. Be certain that you're aware of your requirements so that you buy a service that has all the elements you search for. How Much Does Autodesk Vault Cost? 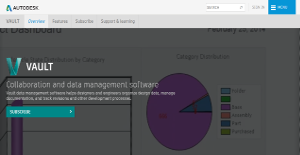 Autodesk Vault offers subscriptions to 3 editions. The details given below are suggested retail prices, excluding tax. We realize that when you make a decision to buy Product Lifecycle Management Software - PLM it’s important not only to see how experts evaluate it in their reviews, but also to find out if the real people and companies that buy it are actually satisfied with the product. That’s why we’ve created our behavior-based Customer Satisfaction Algorithm™ that gathers customer reviews, comments and Autodesk Vault reviews across a wide range of social media sites. The data is then presented in an easy to digest form showing how many people had positive and negative experience with Autodesk Vault. With that information at hand you should be equipped to make an informed buying decision that you won’t regret. What are Autodesk Vault pricing details? What integrations are available for Autodesk Vault? Pros: I have to admit that it is a great tool for anyone looking to achieve better data management in their organization. To start with, if you have an Autodesk Inventor in your organization, then the Vault will come with many goodies on your part. The user interface is simple and anyone can get up and running with this product. It integrates well with MS Office applications to help you save documents in your computer. Even non-CAD users can add data into your system which gives you more leverage in terms of how you can collect data into your database. The copy design feature helps to duplicate and store data which can be used for future projects and thus save time developing them. For your connectivity speed problems, the local AVFS file servers will help you resolve such issues. The fact that it is web-based makes it possible for you to access it from whenever you are. Cons: It is an all-round tool but has a few glitches that would need looking into by the developers of the product. Although the web and client upgrades of Autodesk Vault offer new and better features, you may want to improve the interface. It does not reflect that of a modern tool and the interface does not complement other features of the product. It would be better if it was made more intuitive for ease of navigation by the users. Also, for the connection speed, the check in and the checkout functionalities tend to interfere with it. It slows down the connection speed of the Vault which can result to the delay of the projects or designs. Pros: It offers you with the utmost control of your data and investment in genera. Data security is paramount if you are to make the best designs. With Autodesk Vault, you will be able to control who accesses that data and at what time. The data for your designs should remain secured from access by any unauthorized person. Thanks to Vault, you will be able to keep it secure and achieve change control within your organization. It is also simple to use once you learn how to navigate the features of the tool. Apart from that, it integrates well with the general application in your PC such as excel and word so that you can save all the data that relates to your designs in your PC. Cons: It has everything we could ask for. However, in terms of the functionality it brings with it, it can do better than that. There are a few features that I think could be better to help deliver the best solutions for our data management practices. The search tools can be improved in a way that you can categorize the search into sub-categories. For example, you can include the user or author and also the date on which that data was created. Also, it should provide levels in terms of how much one should access data in those different levels. Finally, I would like to see a cloud-based platform where we can store data and retrieve it regardless of where we are. If you need more information about Autodesk Vault or you simply have a question let us know what you need and we’ll forward your request directly to the vendor.